Morale, discipline and ethical leadership were discussed at the start of the 2014 Next Generation of African Security Sector Leaders program. If an army does not believe in the cause it is called upon to fight for, and if it does not have faith in the organizations and institutions that generate its orders and directives, it will likely come apart when faced by determined and well-armed insurgents. This message as well as the role of leadership, morale, and discipline in conducting security operations were the key themes of the first day of the Africa Center for Strategic Studies’ annual “Next Generation of African Security Sector Leaders” program involving approximately 60 mid-ranking military officers and civilian security sector professionals from 30 African countries. The participants will discuss the importance of military professionalism, ethics, and leadership in the security sector and how these attributes are fundamental to addressing Africa’s contemporary and emerging security threats such as countering violent extremism, piracy, and illicit trafficking. Cultivating such qualities in African states’ security sectors is rooted in a legitimate national vision and constitutional principles that define and empower the relationships between civilians and the security sector. Military leaders modelling the behaviors they would like their subordinates to follow. Military leaders standing by what is right and having the moral courage to point out mistakes or missteps to superiors. Recognizing the intellectual demands of organizing, educating, training, and equipping military forces to execute the missions assigned to them. Another key lesson highlighted was that when the political system is dominated by certain groups at the expense of others, and when these inequities are brought into the military, the army loses its cohesion and becomes susceptible to systematic breakdown in discipline. When that happens, the ability to conduct effective military operations erodes dramatically. Participants were encouraged to read Africa Center Research Paper No. 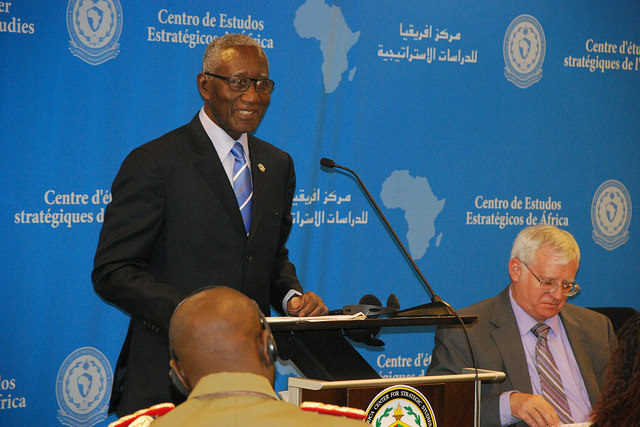 6: Advancing Military Professionalism in Africa by Colonel (ret.) Emile Ouédraogo, for an expanded discussion of these themes.